I wish I had photos documenting the progress that the bees have made in the past couple of weeks. The bees have awakened from their slow state of mind. My split hive finally got to work on the Rite-Cell foundation that they were slow to draw out is now more than 80% drawn and filled with honey! It blew my mind that they accomplished that much work in such a small time frame. My other hive that was from the spring swarm has filled up with brood and honey and pollen. Since there is so much activity right now and there is still a heavy nectar flow happening, I decided to hastily add a honey super to each of these hives. I wanted to give them room to move things around as needed and the swarm hive also has to now draw out fresh comb in the honey super that I stacked on. I purchased it last year but never got to use it. Due to the extreme robbing that I was experiencing with my open feeding method, I decided to switch to an internal feeding method utilizing 1 gallon ziploc bags with slits in them. The bags are positioned by laying them flat across the top bars of the frames. This is not my preferred method of feeding, but it is what I had available on short notice. I’ve tried several methods of feeding and have yet to find one that I like. I’m thinking I may try to build some hive top feeders this fall. I really want a non-invasive way to put on about a gallon of feed at a time. I also began using Honey B Healthy in my feed, thanks to Julie’s generosity. I have instantly seen a difference in their willingness to take the feed. I had hoped to only feed a hive if it was in need of wax and brood boosting, but that instantly caused one hive to rob the other, so I fed both. I plan to stop this very soon as to not end up with honey made from sugar syrup. I got a swarm call Friday evening in Andover, but it was gone within 15 minutes of the phone call. I do still have a complete hive in need of a swarm or split. I suppose I could make a split off of one of my hives, I just hate to intrude on them more than I have already. I feel like I owe it to them to build a strong colony. I still may perform a split. I would love to have three hives going by winter in order to better my chances of making it through with some bees. My next order of business is to start building some additional honey supers. I have held off since I didn’t know if I was going to need them this year, but that is looking very positive right now, so I need to get busy. I will do my best to keep you all updated. Well what can I say… life has been busy lately. From cutting down trees to make room for a new shed to painting hive bodies in hopes of another swarm. I have nothing exciting to report. I’ve just been feeding all of my bees a 1:1 syrup in hopes that they will continue to build comb and lay lots of eggs. It seems to be working quite well. The only caveat of this season has been the Rite-Cell wax coated foundation that I ordered earlier this year. My bees hate it. I had heard this before but a friend of mine in Andover has had great luck with it so I gave it a shot. I won’t make the same mistake again next year. After two full weeks of bees packed all around five frames of Rite-Cell, my bees have have only drawn out about a baseball size patch on one side of one frame. And yes, I sprayed the foundation with syrup. That being said, luckily I have five other frames in the top deep of this hive and the bees have utilized the existing comb on them to do some laying. Since the bees have been hard at work lately, I have as well. 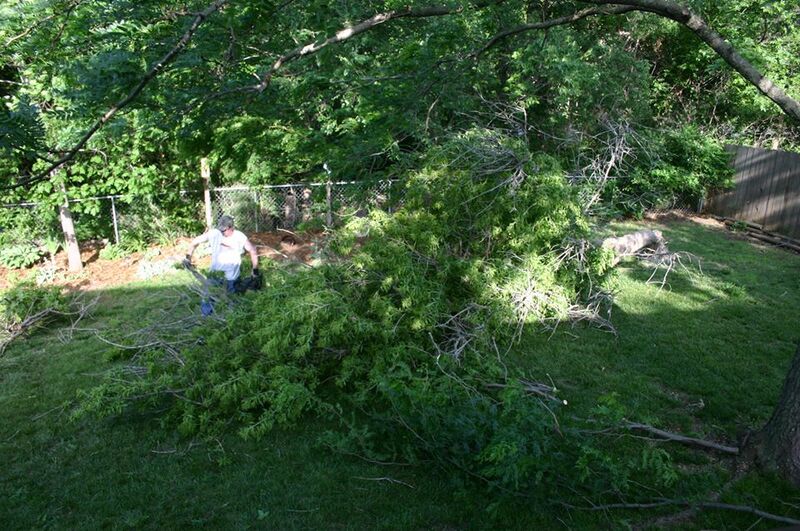 I had to remove a diseased and damaged 40 ft. box elder in a corner of my backyard in order to make room for a shed. Not that this has anything to do with beekeeping, but hey, this is my blog and I’ll do with it what I want. lol. Also, we have had some wet weather and I have been utilizing that time to paint some newly built deep hive bodies and repair some old equipment. 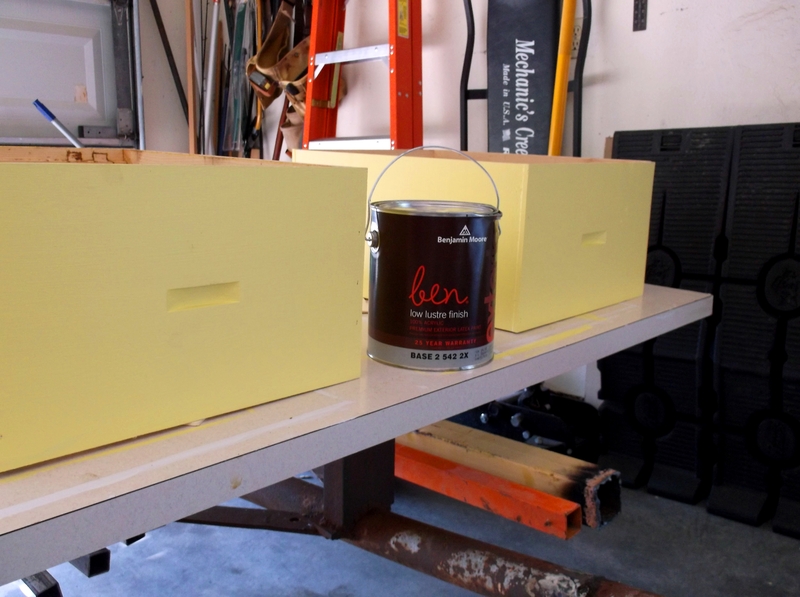 I scored some Benjamin Moore exterior latex at Ace hardware for $5/gal. because the can lip was badly dented. It was white base, but the nice young man working there actually tinted it for me for free and still honored the cheap price. I also had a chance to assemble some frames and prepare my 5 frame nuc box as a bait hive. I placed some existing drawn comb and some new frames into the nuc, along with a small nasanov swarm lure which I embedded into the wax. I built one frame with no foundation just to see how well the bees take to it. A buddy of mine, Will Osborn told me about this method. You simply take the breakaway slat on the top bar of the foundation style frame, pull it off, tip it on edge and lightly nail it in place. 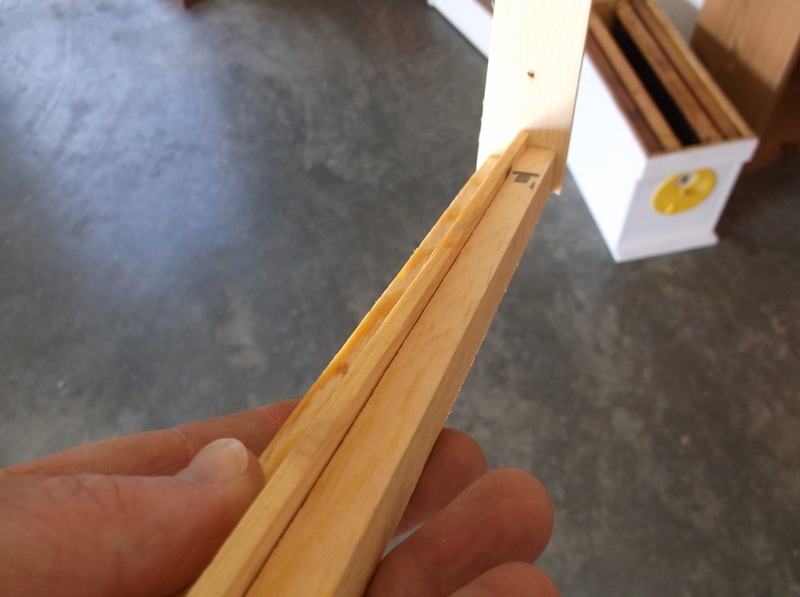 I then rubbed it with some beeswax This acts as a vertical guide for the bees to start building comb. I guess we’ll see. Notice the nuc box in the background. I finally got my yellow entrance disc that I ordered from Dadant. It was on backorder for two months. Go figure. I apologize for the late post and for not having more updates, I just don’t want to spend too much time messing with my hives right now. They are doing what they are meant to do and for now I am trying to leave them to it. Stay tuned. My hives should both be exploding soon with lots of emerging bees. Well, the bees are active to say the least. The hived swarm has a laying queen and lots of bees. They were so crowded that I went ahead and added a second deep to give them room to expand. It already has eggs and will be exploding within a month. They were so bored that they had already attached some comb to the inner cover. There were already eggs there as well. The split hive that I took took out to Mom & Dad’s was close to being honey bound so I gave them another deep as well. It had a laying worker so I sprayed them with syrup and introduced them all. There weren’t enough bees to worry about doing a newspaper combine. There was already at least 30 pounds of honey in their one box. I think they had actually removed some eggs in order to store more honey. I have a bit of a mess in this box. I only used nine frames in their first box. I thought they were all fully drawn, but they have built another thin comb on each side of the two outer frames. I also added the few bees that were left from a previously acquired swarm that was queenless and failing. I am still feeding both hives, but at 1 gallon per day per hive, I may stop soon. I would like to keep feeding to induce comb and brood production, but there is plenty of nectar flow right now that they are missing out on. I may begin to wean them off the juice this week and leave them to mother nature’s buffet. Sorry no photos or video this time. I was just too busy moving things around. The easy combination of the swarm that I collected a little over a week ago. They got separated when I moved them in the middle of the day. Bad idea. On this video I combine the nuc and the 10 frame hive. All of the bees are from the same swarm. Enjoy! Not the greatest quality, but it’s hard to run a camera while wearing a bees suit and gloves. I may get brave in the future as swarms are not prone to stinging, but I have found out first hand that if you make a dumb move and stir up a large swarm like this one, it’s not pretty, whether they are stinging or not. We had a great turnout today out at Bill & Candy’s place. The day started with a one hour meet and greet. It’s always good to see what everyone has been up to and just talk bees. I spent some time with a great family I met last year, the Osborns. I also had some good talks with B.E. Hopper and Gerry, Libby, Chuck and of course, Bill Vinduska. Bill and Candy have a wonderful property. They are very generous to allow our group to take over their home and apiary. Today, we viewed excellent demonstrations. 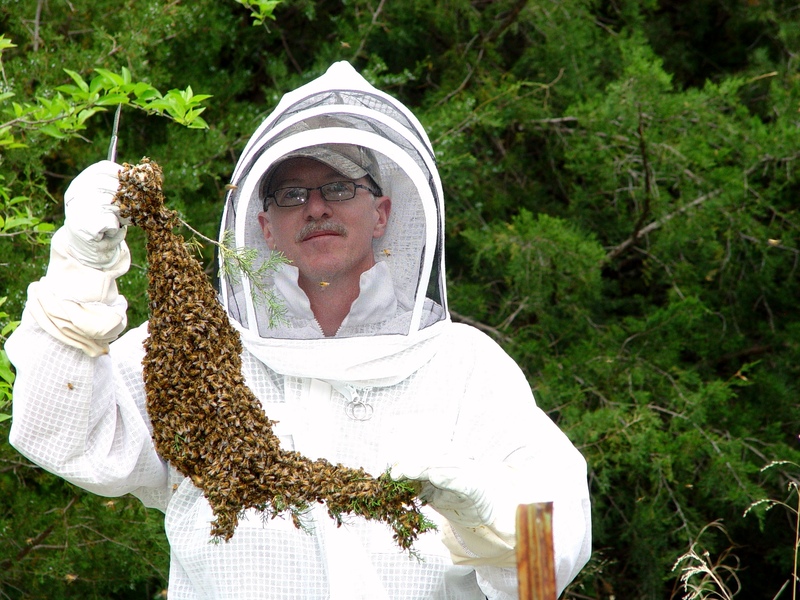 Ivan shared some great tips & tricks that he has picked up over his many years as a beekeeper. 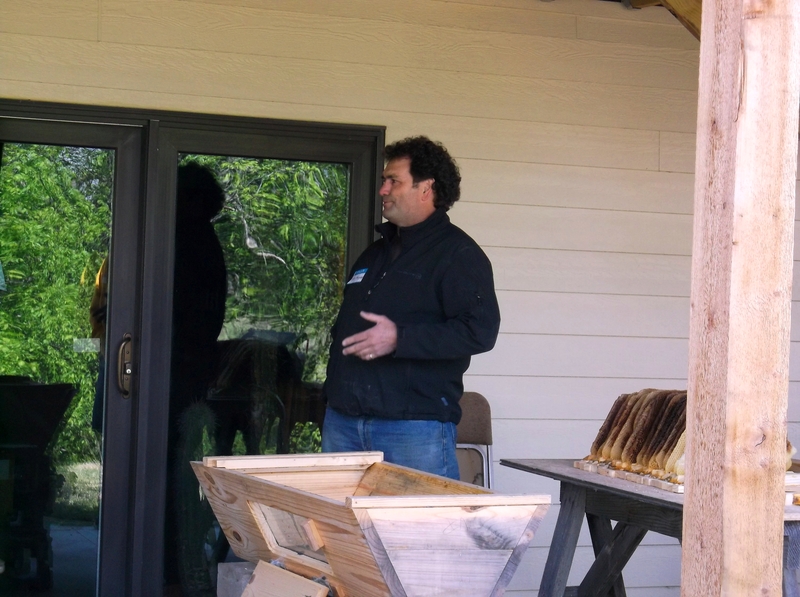 We then got the low down on kenyan top bar hive construction and management from Britt Hopper. Bill showed us how he renders beeswax. Then after Candy arrived back at the apiary with bee packages, Bill demonstrated how to install a package. And lastly, a handful of us took a walk out to the bee yard. A cool front was moving in with an overcast situation and the bees let us know they weren’t happy. Several of us were reminded what a sting feels like. All in all, we had a great time and enjoyed eating lunch together… served from the VInduska honey kitchen. These folks are all top notch and I couldn’t ask for a greater group of like minded beekeeper friends. Thanks SCKHPA. Our mentor, Bill Vinduska getting ready to demonstrate to the SCKHPA group how to install a new package of bees into a langstroth hive. My luck may be changing. I just grabbed this swarm from Mom & Dad’s place just north of Augusta. I only have one very weak hive on their property so I am certain these bees are not from that hive. This swarm was actually close to the location of the placement of my hives from last year. 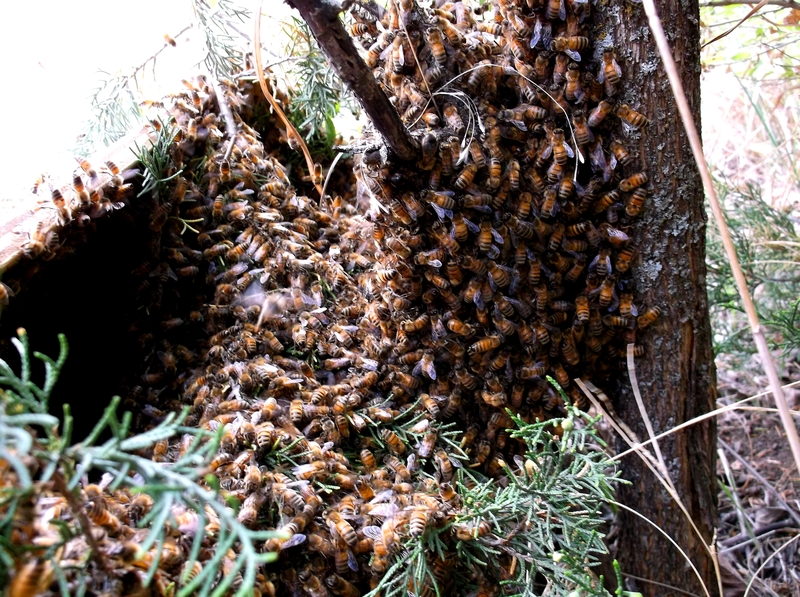 I am now wondering if one of my hives swarmed last year, settled somewhere in a hollow tree that I have not seen, and then swarmed from that hive this season. Either way, I was thrilled to get the call from my Dad. He was mowing and happened to look up and see a soccer ball sized swarm hanging from a tree about 10 feet up. Luckily, by the time I got there the bees had settled much closer to the ground on the trunk of two trees. I wish I had taken a full 10-frame hive to put them in, but instead only had a 5 frame nuc. I placed two frames of drawn comb in the nuc box to leave them some space for a day or two until I can make it back out there with a full size langstroth. More pics to come… and video… if I can figure it out. EGGS… We have eggs ! Today while getting a haircut, I ran into a fellow beekeeper from my club and we had a good chat. After talking bees, I decided to come home and check the progress of my split hive that was queenless and seemingly failing upon my last inspection. The activity at the entrance seemed much more calm. 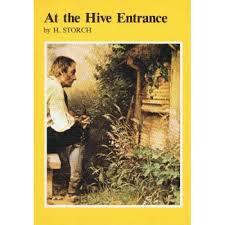 Once I got the hive open, they remained calm with very little smoke. I started pulling out frames of honey which they are now starting to cap. I really thought the entire hive would be capped honey, but much to my surprise, what I found was tons of eggs. My sunlight was not very good and they were very hard to see, but I would say that most of them were laid today or yesterday. The eggs looked good to me. I didn’t see any signs of multiple eggs in a cell which would be a sure sign of a “laying worker” scenario. I just hope and pray that these ladies survive. The bee population is strong as all of the existing capped brood has hatched. After spotting the eggs, I searched for a queen with no luck. I was very gentle with this inspection though, as I was not being attacked like usual, which is a good sign. And a final positive note was the presence of pollen on the outlying cells of eggs. I had not seen this in any previous inspections. With a very mild week of spring on the horizon, I am hopeful once again with this tedious endeavor.